There were impressive performances with a maiden win in the PartyPokerRacing.it Euroseries 3000 from Will Bratt while Stuart Hall and Andy Meyrick had weekends to remember in the Le Mans Series at Nürburgring. Will Bratt put in a fantastic performance in the PartyPokerRacing.it Euroseries 3000 to take his maiden victory in style at Zolder, Belgium on Saturday (22 August 2009). The 21-year-old BRDC Rising Star led the race from start to finish and finished just under eight seconds clear of the second placed driver, Fabio Onidi, on his first visit to the circuit. And to cap off a great day, Will also took the fastest lap of the race with a 1:20.309 lap. After the race, Will said: “It’s such a good feeling to achieve our first win, it’s fantastic for me, for everyone at the team and hopefully marks a major turning point in the season for us. Stuart Hall claimed his first ever podium in the Le Mans Series yesterday at the 1000km of the Nüburgring with Aston Martin, who took a clean sweep of the podium. The BRDC Superstar finished in third place with co-drivers Chris Buncome and Miguel Ramos while fellow Superstar Andy Meyrick claimed fourth place in an Audi R10 TDI with Narain Karthikeyan and Charles Zwolsman. Dino Zamparelli recorded two more podiums over the weekend in the Protyre Formula Renault BARC Championship at Brands Hatch. In race one Dino was third but then in race two the BRDC Rising Star went one better to claim second place. Alex Macdowall made a guest appearance in the Belgium Renault Clio Cup Championship at Zolder over the weekend and claimed fourth place, just missing out on a podium. The BRDC Rising Star was not only competing on an unfamiliar track, but was also racing against his father, Ray, who finished 11th. Jack Harvey recorded a seventh place in the first race of the Formula BMW Europe Championship in Valencia at the weekend for Fortec Motorsport. 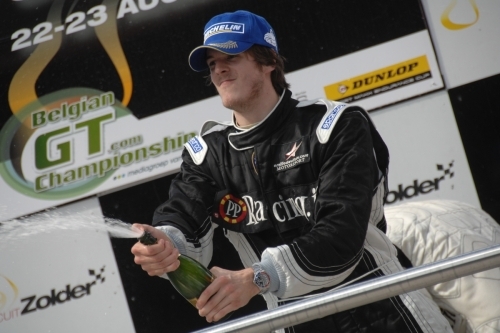 In race two the BRDC Rising Star was ninth.